Welcome to the 18,000-acre natural spa of New York State’s only wilderness canoe region. The Lake Clear Lodge & Retreat is one of the last destination lodges at the portal to the 18,000-acre St. Regis Wilderness Canoe area – home to a paddler’s paradise of 58 lakes and ponds within the largest intact wilderness region east of the Mississippi, the Adirondack Park. The St. Regis Wilderness canoe region is part of the North Flow consisting of 26 navigable rivers, streams and brooks and over 1,400 lakes and ponds. It is also a vital link to the Northern Forest Canoe Trail that runs from the Adirondacks through Vermont, New Hampshire, and Maine. The St. Regis Wilderness Canoe region filled with countless bodies of water with most accessible by canoe or short carries has been set aside for non-motorized use. You cannot put a motorboat in the wilderness canoe region or drive through it. Our lake property faces west into the St. Regis Wilderness region offering the most incredible mountain-lake sunsets anywhere in the world filled with the songs of our resident loons, the flight of our neighboring bald eagle and endless canoe and kayaking experiences. From launching from our lakeshore to a portage to the pristine silence of remote ponds, you can experience it all from expert to novice. Once you arrive at the Lake Clear Lodge & Retreat, you do not need to travel anymore if you wish. Right from your handcrafted lodging door, you can take endless trips for an hour or for days. You can experience an almost unimaginable diversity of water bodies with over 50 species of mammals, an estimated 200 species of birds, a reported 86 species of fish and more than 30 tree species that grow in the region. All within incredible natural mosaics from bogs, ponds to boreal forests and majestic mountain views that all starts from our Lodge. For 3 generations, our family has been avid water enthusiasts. We love the diversity of canoeing in one pond in one moment and in another the next. It is fun for us to plan a trip where you can paddle, mountain climb, fish and swim and do it all in one day. It is all here waiting for you as part of the 18,000-acre St. Regis Wilderness a key natural living theater of the 6 million acre Adirondack Park. Despite our best efforts, even we have only scratched the surface of paddling experiences. The immediate area surrounding the Lake Clear Lodge has some of the most diverse paddling experiences anywhere in the world as it is the dividing line between 2 of the major drainage basins in the Adirondacks: The St. Lawrence River (the largest) and Lake Champlain. There are great opportunities to experience an incredible variety of paddling experience from river rapids to remote pristine ponds where you can see breathtaking mountain views and the largest remaining virgin old growth forest in the U.S., to rare natural wonders found in wetlands – all in one short trip! Our family enjoys side trips with diverse outdoor activities while you paddle including mountain hiking, fishing or simply walking. Cathy and I are foremost innkeepers and not licensed guides and even though our families have lived here for generations even we have not begun to scratch the surface of paddling experiences. Interested in assisting us to update this information? We would love to share your information for others! Please email us! Do not Move! Right from your handcrafted lodging door at Hohmeyer’s Lodge on Lake Clear: A Paddling Paradise! Lake Clear where Einstein paddled is the New York States 28th largest lake and is the largest headwater for the Saranac River with over 9.4 miles of shoreline and an inlet and outlet – to keep it Lake Clear! Lake Clear is also of interest as it the dividing line between those waters that head to the St. Lawrence River and those that go to Lake Champlain. We have found there to be 3-4 fishing “hotspots” with species including largemouth bass, northern pike, brown trout, landlocked salmon, lake trout, bullhead, and yellow perch. A great variety for all members of the family and we have caught some large ones! 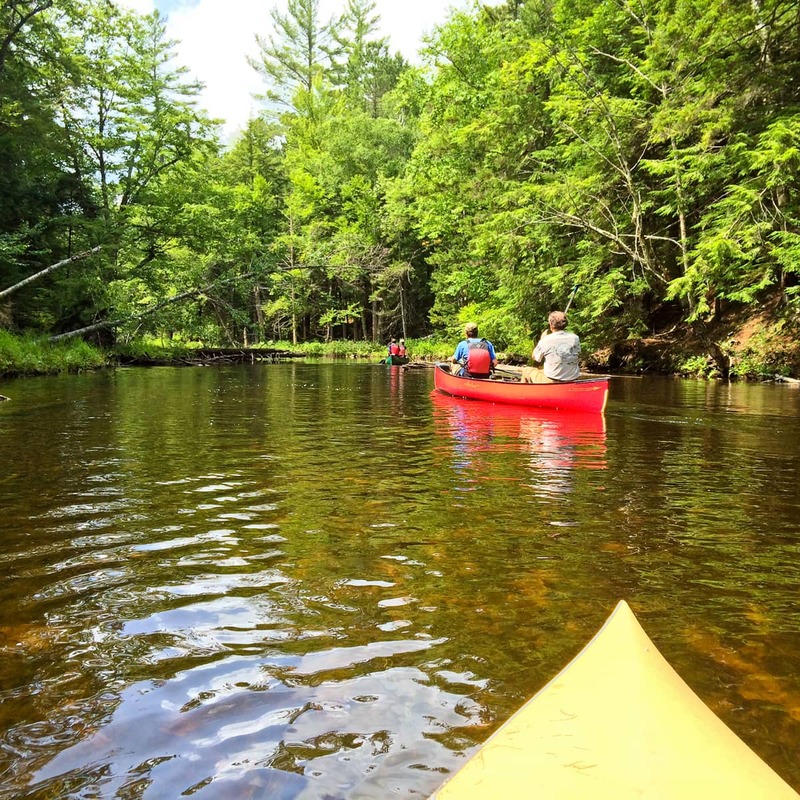 With one of our canoes or kayaks, you paddle from our shore to Lake Clear Outlet as it winds its way to the Saranac chain of Lakes and eventually Lake Champlain. Lake Clear Outlet has nearly 4.5 mi. of shoreline and is a frequent resting and hunting spot for our resident bald eagle! The Lodge is in such a Mecca for birding that a young Theodore Roosevelt wrote a book on birding that exist just in our own County: The Summer Birds in the Adirondacks in Franklin County New York. As you paddle Lake Clear you may see many of our resident birds including peregrine falcons, osprey, hawks, warblers, and ducks and of course our Lake Clear family of loons. In late spring warblers in all colors arrive; songbirds including kingbirds, flycatchers, grosbeaks, waxwings, thrushes, wrens and sparrows, kingfishers, herons, owls especially the barred, wild turkeys and Canadian geese are just a sampling of what you may see! Want more information? Come stay with us! Our Adirondack "concierge" guide will assist you upon your arrival. There is an incredible diversity of paddling experiences within 15 minutes of the Lake Clear Lodge. What follows is a sampling and folks that’s all it is a sampling. There are too many experiences to mention on our web site and we urge you to consult the reference information listed above or other resources. There are many types of paddling trips in terms of duration, difficulty, views, isolation, and ability to undertake comprehensive trips of paddling, hiking, and mountain climbing. For example, longer excursions are available as well in our neighboring waters. The aforementioned “90 Miler” from Old Forge to Saranac Lake; the “Transit Trail” from Piercefield on the Raquette River to the Saranac River to Union Falls (approximately 70 mi. and reportedly with only 5 carries in this route totaling a little over 2 mi.! ); “The Pond Hopping Trail” of about 55 mi that is an intricate trail looping 36 lakes and ponds at the headwaters of 5 rivers: the North Branch and main stem of the Saranac, Osgood, Middle and West Branches of the St. Regis. Finally, we are a critical link to the Northern Forest Canoe Trail linking the Adirondacks to Vermont, New Hampshire, and Maine. The above is just a sampling to give you the breadth of what is available right out the front door of your handcrafted accommodation at the Lake Clear Lodge to within a 15-minute drive. If you undertake a mere 30-minute drive it seems that our infinite universe explodes into a larger galaxy if that’s even possible. The High Peaks, the Ausable River, the Osgewartchie, Lake Placid are just a few other worlds available to you.